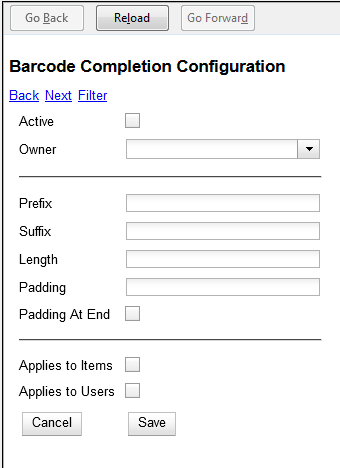 The following data fields can be set for each Barcode Completion rule. Sequence that appears at the beginning of barcode. Sequence that appears at the end of barcode. Character that pads out non-unique characters in the barcode. Check if the padding starts at the end of the barcode. Check if entry applies to item barcodes. Check if entry applies to user barcodes. Length and Padding. Length and Padding are related, you cannot use one without the other. If a barcode has to be a certain length, then it needs to be able to be padded out to that length. If a barcode has padding, then we need to know the max length that we need to pad out to. If length is set to blank or zero, or padding is left blank then they are both ignored. Applies to Items/Users. One or both of these options must be checked for the rule to have any effect.